So-called “exaltants” amplify other smells. Truffles do this by enhancing the flavors around them—an egg cooked with truffles tastes more like an egg. The same thing happens with mature ambergris tincture when it amplifies the smell of the finished perfume; it gives life and vitality to almost any blend. Civet makes flowers smell more like flowers and castoreum gives erogenic gravitas. While most synthetic musks are considered narcotic, natural musk has a strong erogenic component and an ammonia-like element. It improves almost anything. Odors and odor effects are often confused. 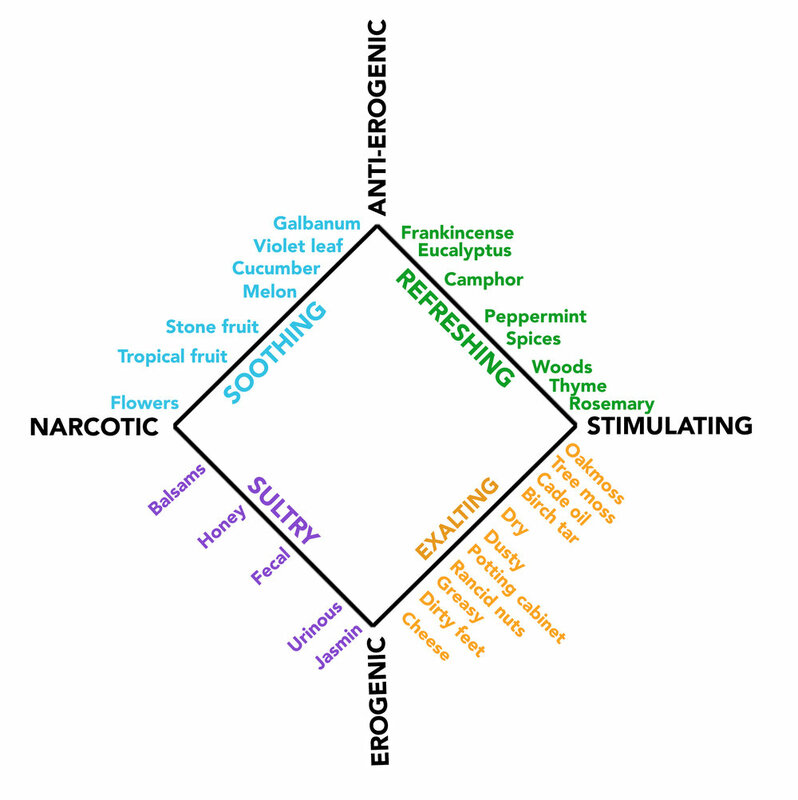 My favorite perfume author, Paul Jellinek, created what he calls the Odor Effects Diagram (shown below), which demonstrates the effects of aromas, rather than odors such as woody or floral. Notice on the diagram that exalting aromas exist along the line between so-called “stimulating smells” and “erogenic smells.” Stimulating smells are resins, woods, and spices. As the line of exaltants approaches the erogenic pole, the smells get funky and animalic. Components with these characteristics are said to “exalt” the perfume by amplifying it. Above all, it’s imperative to have contrasts—not necessarily contrasts of odors, but contrasts of odor effects. As Jellinek mentions, citral, vanillin, and vetiver all have the same stimulating odor effect, but very different odors. The reverse is also sometimes true. Geraniol, phenyl acetaldehyde, and para-cresyl acetate are all considered floral aromas, but their odor effects are different. Geraniol is narcotic, phenyl acetaldehyde is stimulating, and para-cresyl acetate is erogenous. Any classical French perfume should produce all four major odor effects: anti-erogenic, stimulating, erogenic, and narcotic. This creates powerful contrasts within the perfume that attenuate or amplify the ingredients. Some special ingredients contain the necessary elements within themselves. Without these indispensable ingredients, perfumery as we know it would not exist.